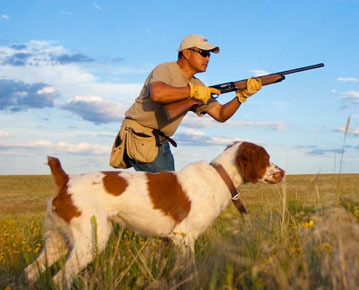 Godfather Gundogs is setting the benchmark for the old traditions of bird dog training, we offer training and development services for all sporting breed and their unique circumstances. It is our honor to provide you with a brief overview of our services above. To start, we like to point out that we do not withhold any trade secrets or keep “classified” information from our customers. 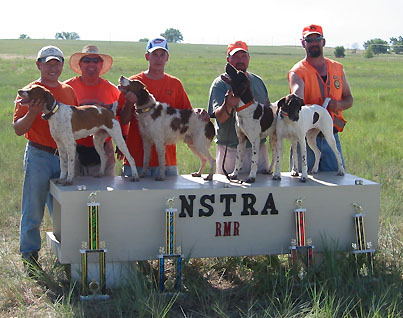 Our approach in training your hunting dog is the same technique used in developing field competition dogs, the only difference may be the tolerable range from the handler. Because of that, the end result you see in a hunting dog will be as pleasing as you will find in a world class field trial contender. The puppy head-start program emphasizes in building pup's ability to learn and the same time out bring the natural instinct bred within each bird dog, we provide a fun yet high spirited environment to ensure each pup has unrestricted of opportunities to make contact with live birds, through these exposure, pups will develop self-confidence, basic sensory formation and concept to cooperation. Program is designed for pups between 4~7 month of age. Course Outline: Socialization & interact with pups of the same age - Introduction to nature - Condition to point of contact - Introduction to live birds - Pointing instinct development - bring out hunting ability & building prey drive - Introduction to structured lifestyle. The foundation program is the extension of puppy head- start program, it is intended for dogs between the age 8~14 month of age but some dogs may start as early as 6-month of age. We begin the course by forming a trusting relationship with each dog before the introduction to basic obedience training, from there we help them develop the skill to hunt for birds, teaching them how to hunt-to-the-front and building the desire to seek game, it never take long before making the connection to capacity, learn the skill of crossing a creek, swimming across the pond or going under the barbwire fence and negotiating other obstacles we find while out hunting. Live birds are always seeded through out the training field, through these early exposure to they begin developing the skill to hunt in to the wind and learn to seek objectives where game birds are likely to hold. As we progress added gun fire are properly introduced so pup will be conditioned to gunshots correctly. Usually, by the end of their program, we end up with a dog that will hunt in front of the gun, it will come to you when called, it should be enthusiastic about finding birds, it will hold the point, gun broke and showing confidence in taking the field. Our program is dedicated in out bring the natural ability in each dog to the fullest potential, that same energy is also channeled in the direction to prepare each dog for the advanced training, the entire course is carried out with least amount of pressure, most dogs are trained not knowing they are being taught, yet learning "how-to-learn" from start to finish. Our objective is sending each pup down the correct learning path, building a solid foundation supporting the more sophisticated training and inspire the desire to please that will last a lifetime. Course Outline: Basic obedience - Bird work - Respond to point of contact - Ground pattern - Introduction to retrieve - Introduction to water - Correcting bad habits - Field hazard avoidances. In the advanced training program, we focus on the total-birddog development. 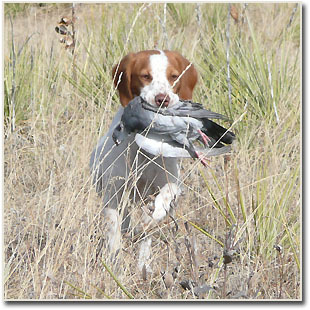 Great bird work executed by a highly trained dog makes every moment in the field a rewarding one. On those perfect day, your dog zero-in on a bird and remain motionless, steady on point and you can sense his intensity and confidence. Such a challenging task call for trusted training by a trusted trainer. If you take a look in our field trial string we believe you'll agree these are not your typical birddog. You probably noticed each dog clear exhibits our unique trademark -- breathtaking style, that's the direct result of our gentle hands approach in training. Each building block of the advanced program is implemented through introduction, understanding and repetition, conditioned to react becomes the second nature. We make certain each dog remain high spirited bear the unquenchable desire to find birds. Whether we are developing a versatile hunting dog or a field trial contenders; Steve always devote his trusted efforts to escalate each dogs potential to the highest level, the result you see is a dog that you can be proud of, creating memory you will not forget. From casting to the front in full stride to turning on a dime, from pointing steady-to-wing & shot to bird-in-hand, this course is for the ultimate bird dog development. The approach Steve take in developing a competition dog and a hunting dog are nearly identical, only difference may be the tolerable distance allowed from the gunner. Our success is measured in every dog, Steve is setting a new standard for the old traditions, his efforts is often copied but rarely duplicated. We require 60~90 day commitment to complete this program. Course Outline: Advanced obedience - Silent & Whistle command - Advanced bird work - Broke to steady to wing, shot and kill - Stop to flush - E-collar conditioning - Marking, retrieving land or water - Honoring (backing) - Snake avoidance. 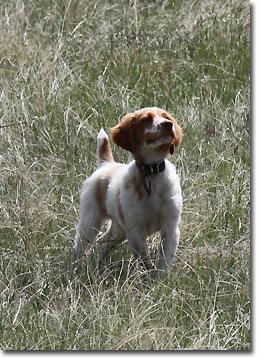 Godfather Gundogs is dedicated in developing all breeds of pointing-dog-athletes for field competition. We are specialized in developing AKC Horseback and walking shooting dogs in shoot-to-retrieve venues. 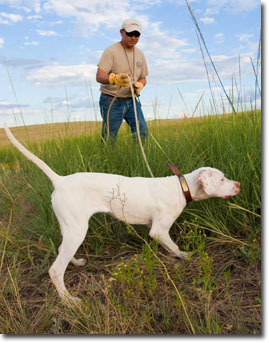 Our expertise extends in to AKC hunt test as well as horseback retrieving stakes. Our services including juvenile dog development, training & campaigning, training for the amateur handlers, conditioning & nutrition strategies for peak performance. 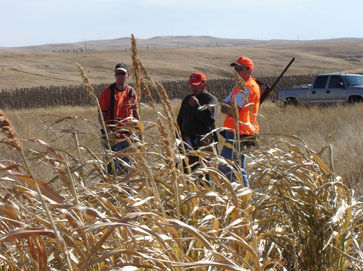 We offer a competitive year round training schedule including summer training in North Dakota and the Sandhills of Nebraska. Please contact us for current rates and fees. Retrieve-to-hand is the finishing touch of every birddog. The one thing is certain, nearly every hunting story implicating a down bird that got away, always ends with ” I only wish my dog would retrieve”. It may sound humorous, but it often be the difference between having a tasty supper or sucking cup-o-noodle for the night. Fortunately, this area of training happen to be one of our specialty, in facilitating dogs lacking in instinct in this area , they can be corrected with trained retrieve or commonly known as the "forced retrieve". In our program, dogs are taught refusal is not an option, further with positive and constructive reinforcement, they are conditioned to open their mouth, reach, pick up and hold for the object presented in front of them, best of all, they do it with confidence, whether is fur or feather. 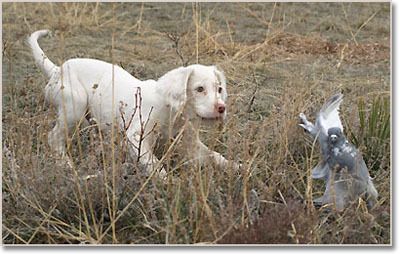 Follow by extensive drills in mocked hunting scenario to further develop the skill to mark and track down birds. In completion what we have is a dog that will rush to a bird, retrieve and deliver to hand, while showing all the enthusiasm as they have been doing it naturally all their life. If you have a good dog, give it a chance, allow us to put that finishing touch with trained retrieve. We also offer an advanced program where they can further develop water retrieve and trailing skills to improve the ability of recover downed game. Though, every dog is different, we have seen dog finish the program in 2 weeks but takes the average dog about 30~40 days to complete this program. Many trainers, amature or professional have created problem (s) in training one time or another. More often than not in the untrained hands, problems of such seldom get resolved without developing in to another one. Likely, most people just learn to accept a mistake that they can live with, but soon you will find yourself with a collection of these "tolerable mistakes" and you have is a dog with more holes than a beehive. Some problem dogs are flat-out frustrating to hunt with, dogs as such can very easily ruin friendships or spoil a outing. When you find yourself in the situation unable to resolve these problems on your own, seeking professional services is your best option. No matter how skilful a trainer may be, to diagnosis problems through the internet or over the telephone is as conducting health examination as such, under the circumstance the result is rarely accurate and providing solutions that is meaningful. For that reason, we insist on meeting you and your dog in person to help you identify the cause and offer the remedy to overcome whatever your problem may be. We are very successful in correcting run-offs (self hunter), gun-shy, bird-shy, creeping, false pointing (lying), flagging, steal point, sitting or lay down on point and many hard to fix problems in birddogs. In case fixing the problems exceed your capabilities and you would like to hire us to help you overcome these issues, the $50 will be credited towards the regular training fee.